In this episode, the digidestined turn the tables on Arukenimon with help from the usual sources- air conditioning, a salt shaker and Pro Tools. Give them points for creativity, but at the end of the day no amount of clever escapes and counters will make up for their own stupidity in getting into this mess in the first place. Ultimately, they accomplished nothing, receiving only a taste of Arukenimon's true power, and met her toadie that makes her team stronger than the good guys. Since it's on the back end of such idiocy, this episode is at a major disadvantage, but the escape itself uses the fun surroundings of Giga House and unique character traits well to create a colorful, albeit unproductive, outing. Cody's the only one on the spider web with free hands, and tries e-mailing all of the others for support. As established, the designated backup had entered the house, split up and are completely outnumbered. So that's out. He comes up with a great solution of turning the air conditioning on to blow off the approaching Dokugumon and make the web less sticky. It takes Ken and Davis's soccer skills to make it happen, adding to the impressive factor. With that great escape... they promptly get themselves trapped again, hiding in a wood dresser from a monster equipped with drill bits. 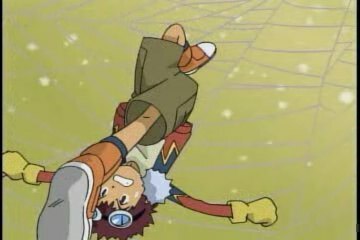 Yeah... things not going so well, so Cody gets on the wire again, this time trying to come up with a counter to Arukenimon's flute that controls all the insects. Assuming that the sound vibrations from the flute are causing the insects to go berserk and answer her every command (which is neither technically “berserk” nor an actual trait among insects), Cody wants to create a noise to counter this. What follows is simultaneously impressive and ridiculously impossible. Pro Tools. The massive prop computer in the office where TK and Kari are hiding has a copy of Pro Tools. Not only is this completely unfathomable, but everybody assumes this would be the case and Yolei high-tails it to the office to show off her mad mixing skills. It would have been nice to get a previous reminder that Yolei's a total geek (it hasn't come up in a long time), but it's certainly within her character and as a bonus, it's acknowledged that Matt's band is basically auto-tuned. Anyway, with some remarkable acrobatics and support from TK and Kari, Yolei manages to record the flute sound, loop it, add some bells and whistles and basically turn it into the latest Ke$ha track. It's creative, it's impressive, and it highlights a side of Yolei's character that needs more attention. It's a shame it's completely unrealistic... and how is sound playing from the office computer reaching all the way to the bedroom where Digmon and Stingmon are? Giga House must have Nano Walls. With the fluting countered, Arukenimon is finally forced into action herself and reveals her true form. Shock! 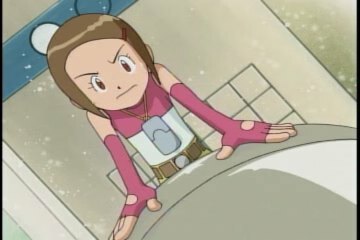 She's a Digimon! This is made out to be some major pre-commercial break revelation, as if we didn't already know this from her shouting out her Spirit Needle technique and having a name ending in -mon. Her big action debut is even more of a dud as while she proves that she can do whatever a spider can, she isn't any stronger than Paildramon. He corners her in the kitchen where she's hit with salt, bug spray and loose electricity, before Mummymon arrives to spare her the indignity of having to explain any of the plot. We don't even get an explanation about why Ken had absolutely no angst about DNA evolution this time around. Two episodes of uncertainty sure goes away in a hurry with an angry spider lady bearing down on you. For all of the tension between Ken and Cody, they sure make for vicious co-conspirators, tossing around complex concepts regarding Operation: Pro Tools like nothing and totally confusing Davis. There was also something involving a story between a moth and a bat, which I had never heard of. Between all that, Davis gets it confused with the story of the birds and the bees. Cody of all people promises to explain it later. Yolei rappelling off the computer monitor directing Kari's mouse-clicking probably represents her character more than any other scene in the show, and I bet nobody remembers it. If this whole house existed in order for Arukenimon to send an insect ambush after the digidestined, why would there be a can of bug spray in the kitchen? And for that matter... loose electrical wires lying around. That's dangerous! I kinda like this episode, minus the increasingly annoying shots of Dokugumon bearing down on Davis, Cody and Ken - in the time it took them to work out their escape plan, Dokugumon should really have reached them. That web was nowhere near big enough for it to take that long. Oh God, yeah that was ridiculous. I remember thinking how *long* it took for Dokugumon to cross that web. It was like that Lancelot scene from Monty Python and the Holy Grail. 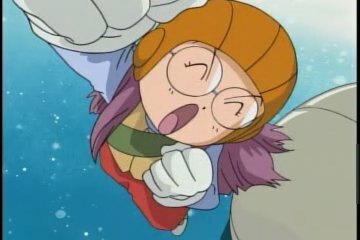 I actually got annoyed toward the end of this episode when the new kids were once again arguing about killing Digimon. To make things worse TK and Kari suddenly jumped on the hey lets not kill anymore bandwagon. That annoyed me the most about this season! I agree with Anon, Takeru and Kari were quick to save Ken from more digi-blood even though they themselves have ordered attacks of kill fully knowing that sometimes you just have too. They know Arukennimon is dangerous and can even handle her own against their strongest player, this should be the first sign that she needs to get deleted and fast. I was very irked when they tried to prevent a death.